Science fiction merged with hard-driving rock and roll Sunday night at the Rush concert in Taylor County Coliseum. Rush has come a long way since the early days when their chief claim to fame was a publicity campaign that had lead guitarist Alex Lifeson billed as the reincarnation of Jimi Hendrix. The coliseum was only about half-filled, but the small crowd was extremely enthusiastic. With each successive album the Canadian group has advanced their individual sound and become more experimental. 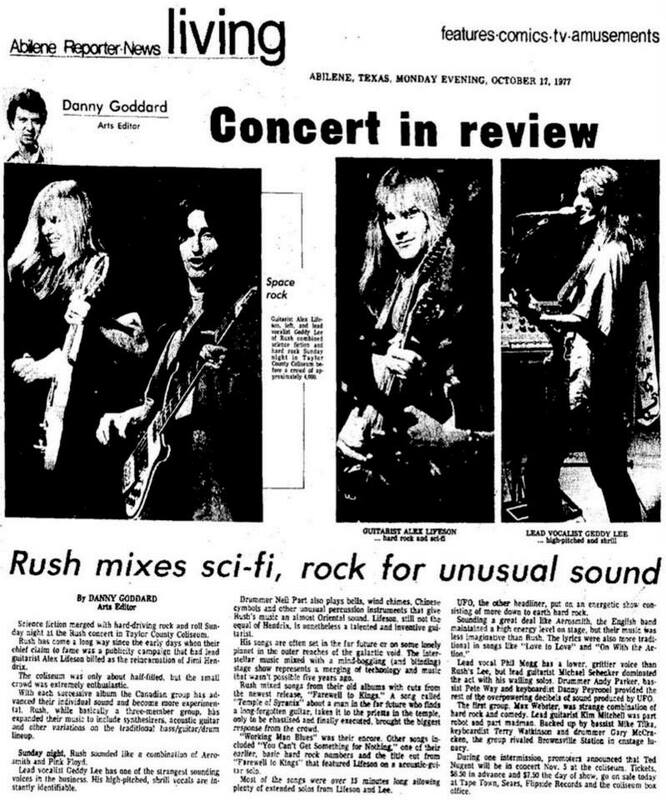 Rush, while basically a three-member group, has expanded their music to include synthesizers, acoustic guitar and other variations on the traditional bass/guitar/drum lineup. Sunday night, Rush sounded like a combination of Aerosmith and Pink Floyd. Lead vocalist Geddy Lee has one of the strangest sounding voices in the business. His high-pitched, shrill vocals are instantly identifiable. Drummer Neil Part also plays bells, wind chimes, Chinese cymbols and other unusual percussion instruments that give Rush’s music an almost Oriental sound. Lifeson, still not the equal of Hendrix is nonetheless a talented and inventive guitarist. His songs are often set in the far future or on some lonely planet in the outer reaches of the galactic void. The interstellar music mixed with a mind-boggling (and blinding) stage show represents a merging of technology and music that wasn’t possible five years ago. Rush mixed songs from their old albums with cuts from the newest release, “Farewell to Kings." A song called “Temple of Syryinx" about a man in the far future who finds a long-forgotten guitar, takes it to the priests in the temple, only to be chastised and finally executed, brought the biggest response from the crowd. “Working Man" [sic] was their encore. Other songs Included “You Can’t Get Something for Nothing," one of their earlier, basic hard rock numbers and the title cut from “Farewell to Kings" that featured Lifeson on a acoustic-guitar solo. Most of the songs were over 15 minutes long allowing plenty of extended solos from Lifeson and Lee. UFO, the other headliner, put on an energetic show consisting of more down to earth hard rock. Sounding a great deal like Aerosmith, the English band maintained a high energy level on stage, but their music was less imaginative than Rush. The lyrics were also more traditional in songs like “Love to Love" and “On With the Action." Lead vocal Phil Mogg has a lower, grittier voice than Rush’s Lee but lead guitarist Michael Schenker dominated the act with his wailing solos. Drummer Andy Parker, bassist Pete Way and keyboardist Danny Peyronel provided the rest of the overpowering decibels of sound produced by UFO. The first group, Max Webster, was a strange combination of hard rock and comedy. Lead guitarist Kim Kitchen was part robot and part madman. 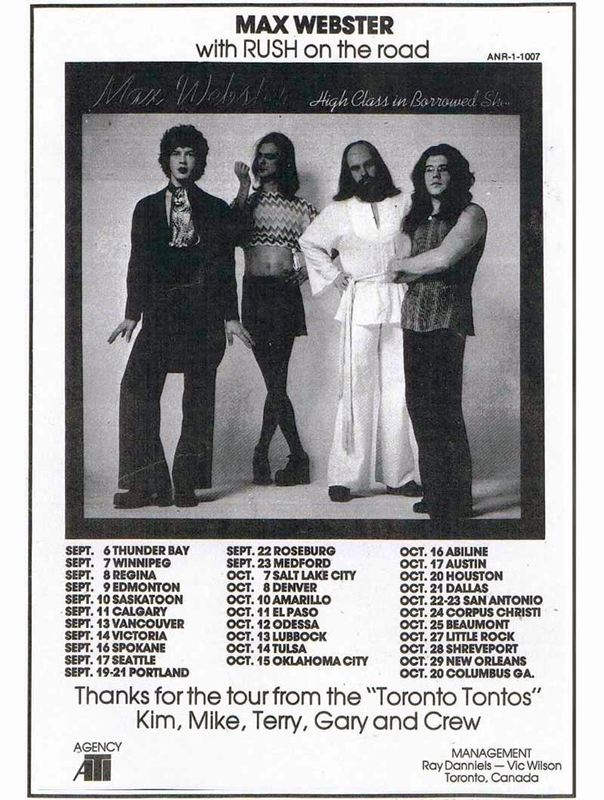 Backed up by bassist Mike Tilka [sic], keyboardist Terry Watkinson and drummer Gary McCracken, the group rivaled Brownsville Station in onstage lunacy. During one intermission, promoters announced that Ted Nugent will be in concert Nov. 5 at the coliseum. Tickets, $6.50 in advance and $7.50 the day of show, go on sale today at Tape Town, Sears. Flipside Records and the coliseum box office.